Chapulines have become a snack favorite among baseball fans in Seattle. Follow their path from Oaxaca, Mexico, to Safeco Field. MEXICO CITY -- If you close your eyes, you might forget you're eating insects. The taste -- and even the texture -- are familiar. The crunch mixes with the citrus taste and a hint of chili seasoning. If you fixate on the baseball game, you might be convinced it's just another ballpark snack. But the dehydrated grasshoppers within the plastic, four-ounce cup were harvested, processed and shipped from a specific region and a supplier more than 3,000 miles away. To many, the insect might be a novelty - a quirky highlight for an Instagram story from a day at the ballpark. To those in Mexico consuming them for centuries, they are a building block of nutrition. "One of my earliest memories as a child is grabbing them in the fields and taking them to my grandmother," says Josefina Lopez, a native of Oaxaca and the executive chef at Chapulin, a Mexico City restaurant in the posh Polanco neighborhood, which specializes in serving the dish. "It's very traditional in our cuisine. I would watch her cook it, the preparation was so simple and yet the result was so delicious." The people of Oaxaca, Mexico have been catching and eating grasshoppers, or chapulines as Oaxacans call them, since at least the 16th century. The insects are cheap and pack great nutrition. The Spanish conquistador Hernan Cortes' subjugation of the mighty Aztec empire in 1521 brought swift, brutal change to an entire civilization. Riches were plundered, people were enslaved, gods and native religions were replaced. Missions to indoctrinate natives into the Christian faith saw the arrival of thousands of Spanish priests. One of these men, Bernardino de Sahagun, documented his experience as a stranger in a strange land, helping to save some of the remaining cultural aspects of a people already under siege. "They also eat a type of locust they call chapolin chichiaoa, which they make into a casserole, and it's a very tasty food," he wrote in his work, the Florentine Codex. Sahagun arrived in the western Mexican state of Oaxaca, considered the cradle of grasshopper consumption. There, he observed indigenous peoples cooking the insects for the first time, writing the first recorded instances of the dish as prepared by natives. Through the adapted pronunciation of chapolin, Mexicans call the insect chapulín while the rest of the Spanish-speaking world refers to grasshoppers as saltamontes. Half a millennium after Sahagun wrote about them, chapulines remain a staple in Oaxacan culture. The chapulines at Lopez's restaurant, however, are reaped from Oaxacan fields, picked by farmers taught a tradition centuries old. 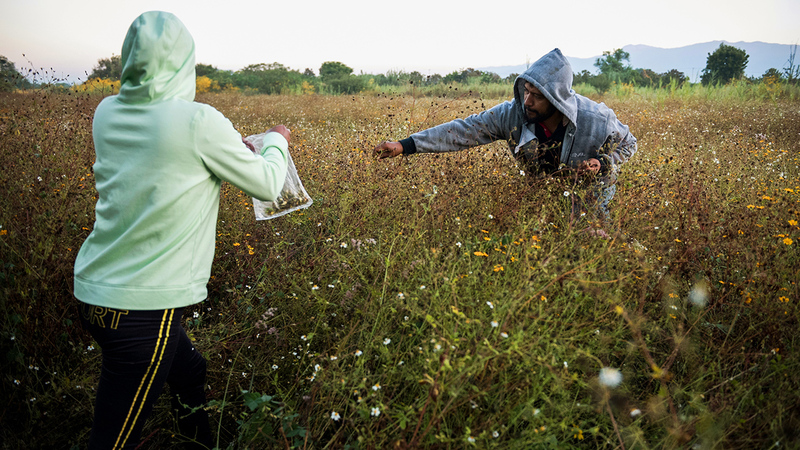 Hilde Carreño Gonzalez catches chapulines -- or grasshoppers -- by hand on his farm just outside of Oaxaca, a practice that is centuries old. A man drives a donkey cart along a dirt road cutting through farmlands outside of Oaxaca. The Food and Agriculture Organization estimates that more than 1,400 insect species are used as food worldwide. Farmers in the region catch grasshoppers not only to send the insects to market but also for personal consumption. 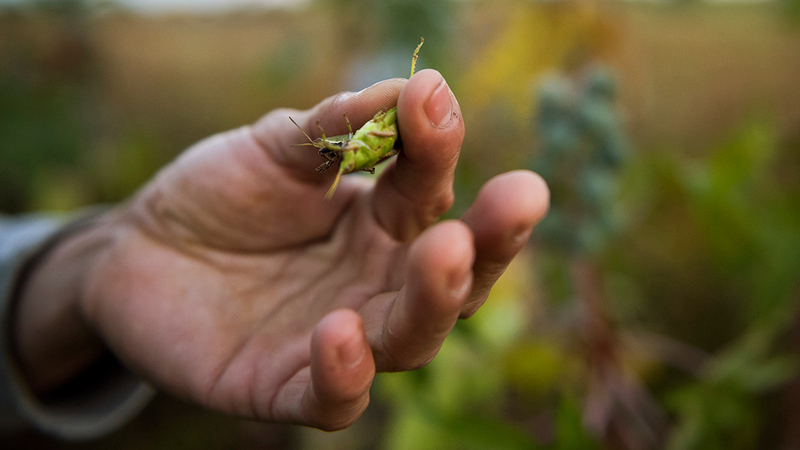 Farmers catch grasshoppers with their bare hands in maize fields called milpas. While grasshoppers are raised in captivity, this method is traditional for harvesting in Oaxaca, Mexico. Even though their hearts are slowed, it is vital to trap the grasshoppers in your hands with one swift motion. The sun has not yet gone up over the hills surrounding Santa Maria Coyotepec, a small town seven miles south of Oaxaca's state capital and largest city, Oaxaca de Juarez. With temperatures in the low 40s, the damp air hangs heavy in the dim light, and dew drips off the maize stalks onto the ground. This is the peak time to gather chapulines. Going into a hibernation-like state at night, chapulines are able to slow their heartbeat to a minimum, a mechanism allowing them to survive freezing temperatures. Thus, the insects are slowed before sunrise. "Sometimes they'll react and hop before you grab them, though," warned Roberto Perez, a food engineer guiding the harvest. 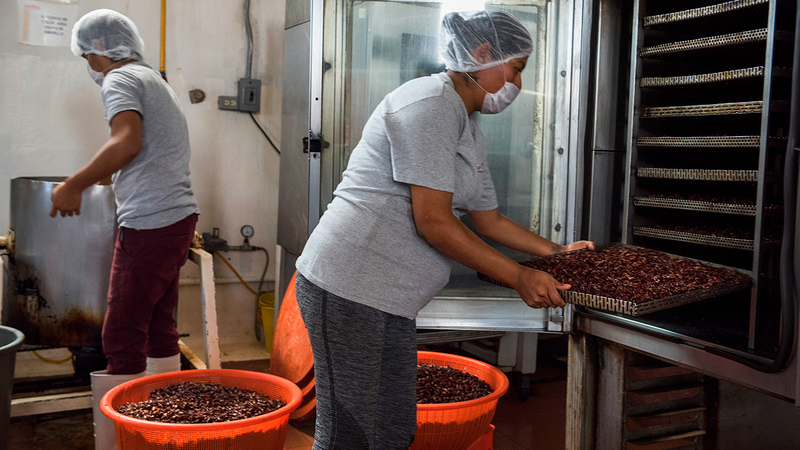 Perez and his partner Hugo Sandoval founded Inalim (Industrias Alimenticias) in Santa Maria Coyotepec more than a decade ago, with the goal of applying industrial standards to the production and distribution of chapulines-based products. "This is a remarkable insect. And it can truly solve the problem of world hunger," Sandoval explained. The Food and Agriculture Organization within the United Nations predicts the world will reach 9 billion inhabitants by 2050. 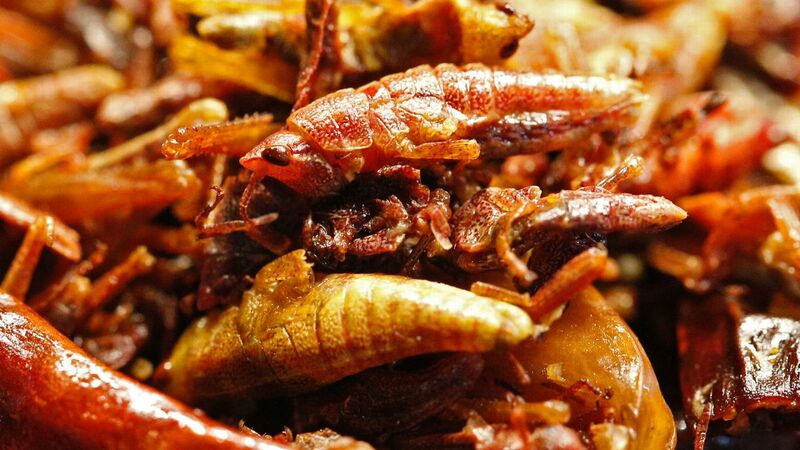 By then, chapulines - and other high-protein insects -- could represent a significant source of sustenance for the world's population. "Crickets need six times less feed than cattle, four times less than sheep and twice less than pigs and broiler chickens to produce the same amount of protein," the FAO states in its report about insect consumption. Small groups of farmers slinking around plants and snapping at dormant animals with their bare hands remains the traditional method. Each year, harvesters roam the fields in Oaxaca and surrounding Mexican states, picking them off corn plants called milpas and selling them in large quantities to local markets. However, this model is rapidly shifting in the 21st century. To keep costs down and maximize production both at home and abroad, Inalim's engineers are also raising chapulines in captivity, which eliminates the risk of the insects in the fields being potentially misted with pesticides. "This allows us to sell year-round and eliminate a number of variables," Sandoval said. A farmer holds a handful of live grasshoppers he just caught outside of Oaxaca. During harvest, farmers catch chapulines in cornfields called milpas. Robert Perez, left, and Hilde Carreño Gonzalez work the farm. Despite Oaxaca having plenty of natural resources, the region struggles with poverty. Aracely Reyes Pacheco returns home carrying a bag of freshly caught grasshoppers. A 35-ounce bag of chapulines costs about $11 USD at a local market. At the Inalim factory in Oaxaca, Mexico, the grasshopper that are caught by local farmers are prepared and packaged for shipping locally and around the world. 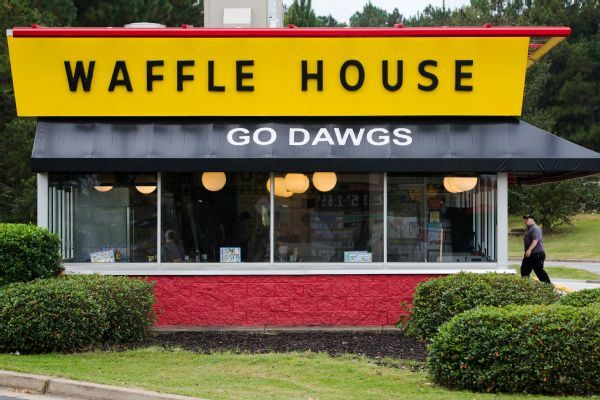 The first employees arrive at 4 a.m., on the dot. Walking down the dirt road, past the chain-link fence and into the factory, they scrub up and unload boxes of tomatoes, chilies, avocados and garlic - but no chapulines. Inalim built a small factory, hiring locals to run every part of the process. The group of employees who begin each workday before dawn are in charge of washing and disinfecting produce, creating a batch of salsas and seasonings not uncommon at other processing facilities for mainstream Mexican food items. Because the company exports its products to other countries as well as selling within Mexico, they have undergone several evaluations for hygiene and quality certifications, including FDA approval in the United States. To ensure quality and professionalism, workers are trained for weeks before they touch a single food item, and after they are fully integrated, their assembly line routine is consistently checked for accuracy and timed by supervisors. "Everything is on a tight schedule, that's why I don't worry about the clocks," Sandoval said while guiding a tour of the factory, chuckling while pointing to a couple of out-of-service clocks on the factory wall. The chapulines at Inalim are first deposited into massive pots of boiling water, to ensure purification. Then, they are sorted and checked by hand, before placement on large metal sheets that go into industrial ovens, in order to dehydrate and toast them. After cooling, the dried chapulines are vigorously sifted in oversized strainers, in order to remove their antennae and legs, which feature jagged spines meant to help them grasp onto surfaces. "They can sometimes lodge in your gums, tongue or even your throat, so we take them off," Sandoval explains. Following another round of cleaning, some of the chapulines are sorted for integration with other ingredients on the assembly line. Others, directly packaged into different sized bags, go to restaurants and chefs who will use their own additional preparation methods. Workers wash and then boil chapulines in water, lime and salt at the Inalim facility in Oaxaca. Inalim, the only licensed exporter of grasshoppers in the country, buys grasshoppers from farmers across the state. Workers prepare the chilies and tomatillos for the chapulines seasoning and salsas at the Inalim facility in Oaxaca. After being washed and boiled and further prepared, the chapulines are spread out on metal flats and put into an oven and toasted. This is when the chilies are added. After being left to cool to room temperature, chapulines are sealed in bags and readied for shipping. Grasshoppers are a common order at Poquitos restaurant in the Capitol Hill neighborhood of Seattle, as well as their location at Safeco Field. 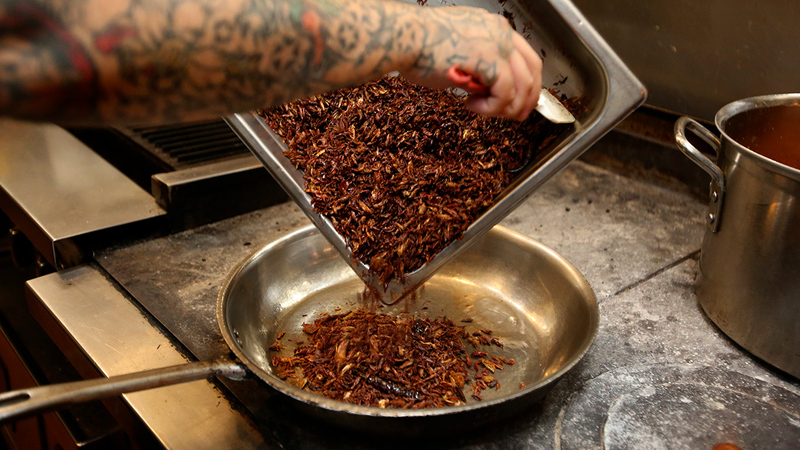 Executive Chef Manny Arce ships the insects directly from Oaxaca, Mexico. The concept of ballpark foods conjures up images of hot dogs, peanuts and other assorted staples of stadium fare. In the last generation, offerings have become broader, more global, and include some high-end cuisine in America's ballparks. For Manny Arce, Executive Chef of Poquitos restaurant, offering an unexpected twist on foodstuffs was exactly the reason why he wanted to further disrupt the status quo of ballpark offerings prior to the 2017 MLB season. Poquitos restaurant, in the Capitol Hill neighborhood of Seattle about five miles from Safeco Field, has sold the insects at the restaurant for years, after Arce spent time in various locations within Mexico - including Oaxaca -- studying regional fare. "When I first got them, five or six years ago, I had traveled to Mexico and I thought they were very interesting as a cook," he said. Authenticity was important to Acre in importing the grasshoppers to the Pacific Northwest -- the insects used by Poquitos are shipped directly from Oaxaca. Chapulines, as a food, are versatile. They can be served alone, or as a center of a dish, like in a taco, or as a topping - adding taste and texture. Arce prepares his chapulines the way many families cook them in Oaxaca: they are toasted and dried further, and later infused with chili lime salt before serving. 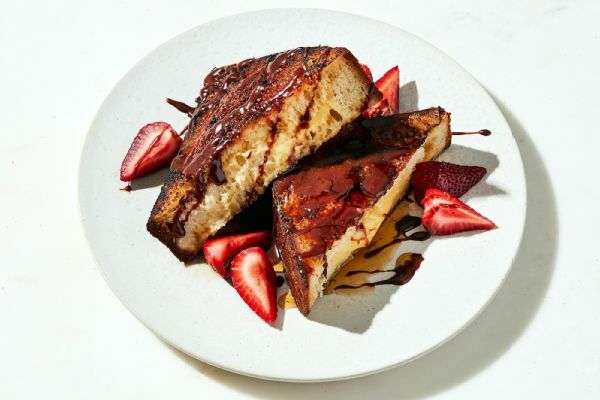 "Manny went to Oaxaca and brought a bunch of knowledge back in order to translate that into the best dishes," said Steve Dominguez, general manager of Centerplate, the company in charge of catering and concessions at Safeco Field. 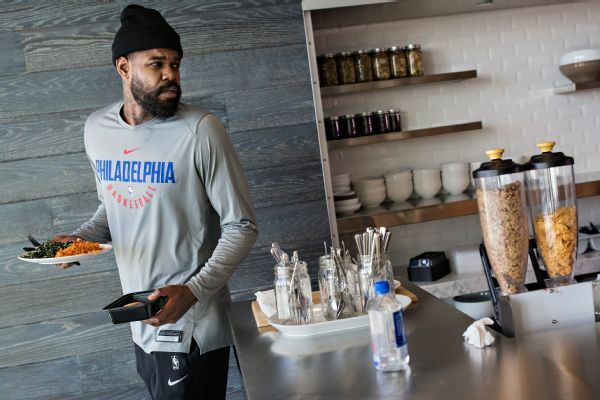 "For me, that was kind of the premise to bringing them in and serving this at the ballpark," he continued. "That's why we worked with the Poquitos group, they're well-known for their authenticity and their quality." After selling Centerplate on the viability of the item, the final and biggest test was upon them: what the ballpark fan thought. Manny Arce, executive chef, brings a bag of chapulines into the kitchen at Poquitos restaurant in Seattle. The chapulines are heated in a pan and seasoned before serving. The fully prepared chapulines at Poquitos, the restaurant in the Capitol Hill neighborhood. The finishing touches were applied by executive chef Manny Arce before heading to Safeco Field. Tim Preston readies chapulines at Edgar's Cantina food stand at Safeco Field late last season. 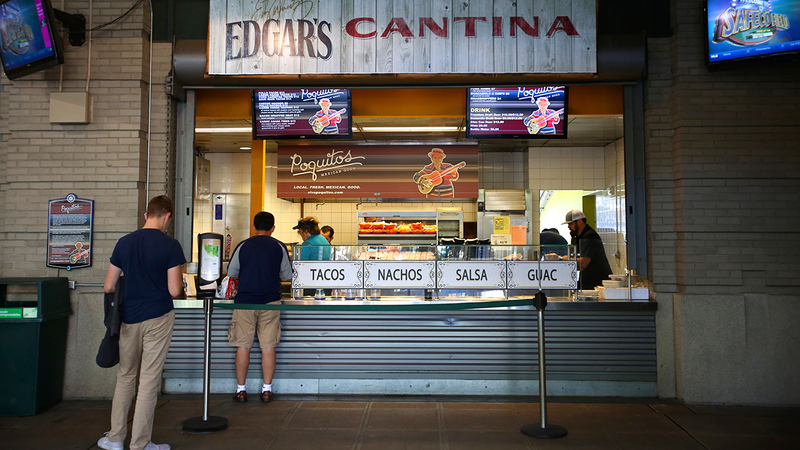 After a final warming in the kitchen, chapulines are placed into 4-ounce plastic containers and sold for $4 at Edgar's Cantina at Safeco Field. The grasshopper snack sold at Safeco Field has become so popular that they had to cap the amount of orders per game. Watch as fans try the Mexican dish for the first time. 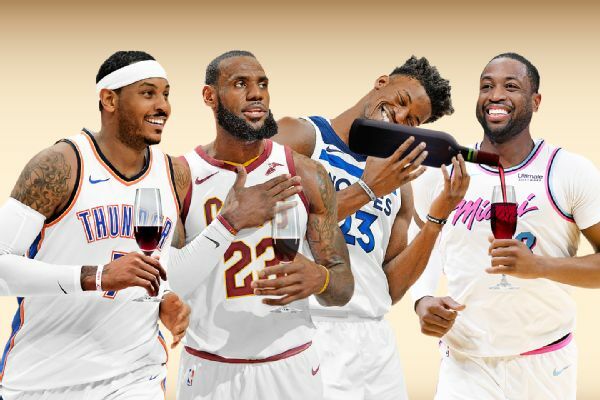 "I think one thing most people are afraid of when they imagine eating insects is that they'll be squishy or gooey inside," said Brittney Bollay, a Seattle Mariners season ticketholder. "But the chapulines were light and crunchy, and mostly tasted like lime with a hint of chili." Poquitos' reputation as one of Seattle's finest Mexican eateries is well known. The restaurant has been lauded among the city's best in their category, which is why during a pre-Opening Day function for local media, they created quite the buzz upon unveiling chapulines as a menu item. "At first, people were shocked when they saw them," said Arce. The media's coverage was widespread, prompting added curiosity from fans. "On Opening Day the food lines are always ridiculous," Bollay said. Like many others, she was one of the fans hyped up by the announcement before the season started. She had to wait a few days to try them, as demand for the item far exceeded Poquitos' wildest expectations. By just their first home series last season, the team had sold more than 18,000 grasshoppers, according to Mariners spokesperson, Rebecca Hale. It is more than Poquitos restaurant usually sells in an entire year. The massive demand prompted the team to make a supplemental order to their provider to cover the expected quota during the rest of their homestand in mid-April. Fearing the rush shipments would become a regular occurrence, the insects were limited in their availability. Now, the restaurant caps the item to 312 orders per game -- a number picked in honor Mariners legend Edgar Martinez, who posted the figure as his career batting average. Throughout the season, baseball fans tried the dish as a kind of badge of honor, as fans posted their reactions on social media. It might be a big stretch to say Poquitos and the Seattle Mariners represent a significant introduction to insect consumption in the United States, but they have broadened the concept of typical ballpark food. At $4 per serving, chapulines plucked from the fields of Oaxaca, processed in Mexican factories and shipped to a corner of the continental United States end their journey in a nondescript clear plastic cup, many times on the other side of a smartphone's camera lens. "[At Safeco Field], people often ask me if they are alive," Arce said. "But those are common questions you'd make if you were eating something new. When they walk away, you can tell they're quite satisfied." Keisha Whitfield, center, reacts with friends after she ate a chapul�n for the first time before the start of a game. All sorts of reactions flood social media from Safeco. Jovan Reyes of San Diego adds some chapulines to an order of carne asada nachos. Chapulines are a versatile food. Danae Johnson, left, of Salem, Oregon, enjoys a bite of chapulines with fellow Mariners fan Dannie Dang, at Safeco Field. "I like them. They're crunchy and spicy. It's kind of like nuts, but not totally," Johnson said.